While you can replace a lot of desktop apps with online equivalents when using a Chromebook—and even run Linux apps—you can’t exactly transfer your local media library wholesale from Windows or macOS to your thin and light laptop. Here are some of the smartest ways to take your media library anywhere. Of course we’re not privy to exactly how you’ve got your local library set up at the moment, or your programs of choice, but you should find enough options in the list below to work out some kind of solution. Some rely on keeping another laptop or desktop around to serve media to your Chromebook, but you can also transfer everything to the cloud if you’re getting rid of your original computer. The only media files you can’t transfer at all to Chrome OS are iTunes movies and TV shows. There’s no way to get at them over the web, there’s no Android app that can play them, and there’s no iTunes for Linux. It’s one reason not to buy all of your digital media through iTunes in the first place! On a very basic level, you can hand over a few dollars a month to Google, Microsoft, Amazon, Dropbox, or another service, upload all your video and audio content to the cloud, and then stream it through the web interface of your chosen service. How much you’ll have to pay depends on how much digital stuff you’ve got. All the apps we’ve just mentioned (and several more besides) will be only too happy to stream audio and video through a Chrome OS web tab, as long as they’re saved in a popular format, and unencumbered by any kind of DRM protection (so iTunes video is out, as we’ve already mentioned). iCloud will play audio tracks over the web, but not video. It’s a quick and rough fix, and of course, you don’t get anything fancy like support for playlists or the option to roll automatically on to the next episode of a show when the current one has finished. Netflix it isn’t, but if you’ve only got a few files that need transferring, it does the job. If you’re primarily interested in moving your music library across, Spotify can help, as long as you’re willing to cough up for the monthly subscription fee. To point the desktop client towards your local media files, head to Settings (via your avatar icon), then click Add a source under Local files. If you’re a heavy iTunes user, for example, you can point Spotify to your iTunes folders. Should you need to move across specific playlists as well as tracks, we’d recommend Soundiiz: It can do iTunes to Spotify, and works with a bunch of other streaming and local services as well. What you can’t transfer, however, are any smart playlists—this is a feature that streaming music services have abandoned, unfortunately. With the transfer done and your local files imported, you can fire up the Spotify app for Android or the web on Chrome OS and start listening. Of course with a Spotify premium account you might not need to add your local files at all, but if there are gaps in the Spotify catalog (and there’s always a few), you can fill them—though note that only Spotify for Android can stream local files you’ve added, not Spotify on the web. If you want to get your local music files on your Chromebook, and you don’t want to pay any money, and you need to get rid of your original laptop or desktop, Google Play Music is perfect: It lets you upload 50,000 MP3 tracks to the cloud for no charge, and then stream them to wherever you like. The best way to do this is to open up Google Play Music on the web on your Windows or macOS computer, then click the menu button (top left) and pick Settings then Add your music. Just point the app to the folders where your music is stored, and it gets transferred wholesale to the cloud. If you need to preserve playlists too, check out the aforementioned Soundiiz. Fire up Google Play Music in your browser on Chrome OS, or load up the Android app on your Chromebook, and all your music is ready to go. It works so well that it’s a shame Google Play Music is getting rolled into YouTube Music—though Google has promised to eventually migrate this feature (as well as other Google Play Music features) over to the new service, so let’s hope it’s true to its word. Plex is undoubtedly the most comprehensive option here, covering both music and video, as well as photos and more if needed. You do need to keep your original computer around to serve up media to your Chromebook (and switched on whenever you need your files), but you don’t have to pay anything if you’re just accessing Plex through a web browser, no matter where you are in the world. The Plex server client is the key, sitting on your Windows or macOS machine, scanning and organizing your media libraries, and serving up the files whenever your Chromebook demands them. It includes all kinds of cool features—such as an auto-play mode that shuffles you right on to the next episode of a show when you’ve finished the one you’re currently watching. From Chrome OS, simply load up Plex on the web, and all your videos and music are right there for you to enjoy. As long as you’ve got a relatively reliable internet connection at both ends of the link, it’s almost like being sat in front of the computer where all your local media is stored. Thanks to the magic of Chrome Remote Desktop, you can access a Windows or macOS computer remotely from your Chromebook, but based on our experience it’s not really suitable for media streaming—video is completely out of the question and audio performance is patchy at best. 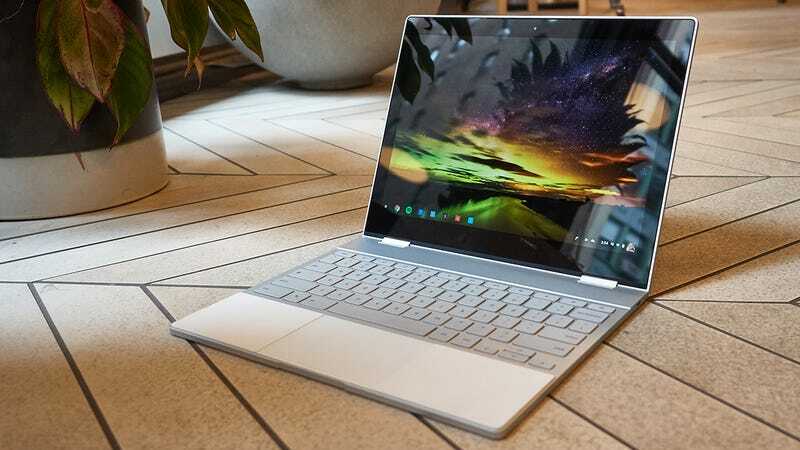 Thanks to the increasing amounts of local storage on Chromebooks (the Pixel Slate comes with up to 256GB), you could copy over all your audio and video files over and access them locally as normal. It’s not all that elegant a solution—Chrome OS only has a basic file manager, and its apps are designed to work with the cloud—but it’d work well for those times when you’re without wifi access. For the best results, you would need a Chromebook supporting Android apps (most now do), and a suitable Android media player (VLC and MX Player are good bets, as always). However, if you don’t need anything extra like playlists or shuffled playback, Chrome OS will play most local audio and video files in a tab if you just double-click on them.